The second German paperback edition of Tony Hillerman's 1973 novel Dance Hall of the Dead was published in 1993. 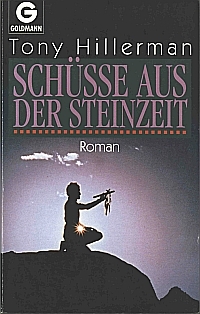 The German text was translated from the English by Helmut Eilers, the same translator for the 1976 Rowohlt German paperback, and the German translations are identical. The front cover is a full color photograph of a man in profiled silhouette offering a prayer stick to the sky. The photograph is attributed to Gauting Viesti. Binding: Paper cover with full color front cover and green, black, and red text on the spine and back cover.